2011 has been an interesting year for Mega Man. While game releases have been few and far between (with only one currently pending), the year has been mostly predominantly owned by merchandise. 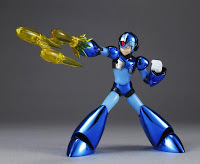 To keep interest in the property alive, Capcom and partners are seemingly quelling our appetites for the Blue Bomber with comics, toys, and other miscellaneous goods. That's not a bad thing in the least. Getting the brand out there beyond the games is ideal to having a healthy and dynamic intellectual property. 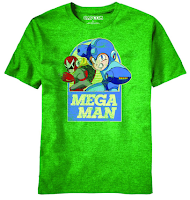 The strategy of extending Mega Man's likeliness outside of the confines of games is looking to continue as once again, Capcom intends to capitalize on the popularity of video game apparel. Come late September, Mad Engine will roll out a brand new Mega Man-themed tee-shirt, pictured right. Breaking tradition, it seems Mad Engine is ditching 8-bit sprites and a witty slogan in favor of Mega Man and Proto Man artwork (complete with nostalgic Mega Man 2 box art styled font). A nice change of pace if you ask me. The shirt is a little ways away off, due on September 28 (according to Midtown comics) for $16.99. A variety of online shops are currently offering pre-orders in a number of sizes. If you're not a fan of green, steer clear of this one; it's the only color being offered. That's not to say more colors will be offered, however. It may not be that spiffy new game you've been looking for, but hey it's something. 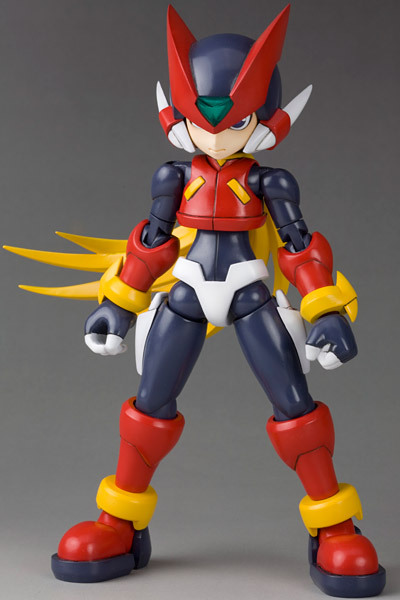 Not surprisingly, Koto US has confirmed a North American release for their 1/10 scale Mega Man Zero model kit. Due out this October in Japan, the localized figure will hit U.S shores in December, reports Game Informer. 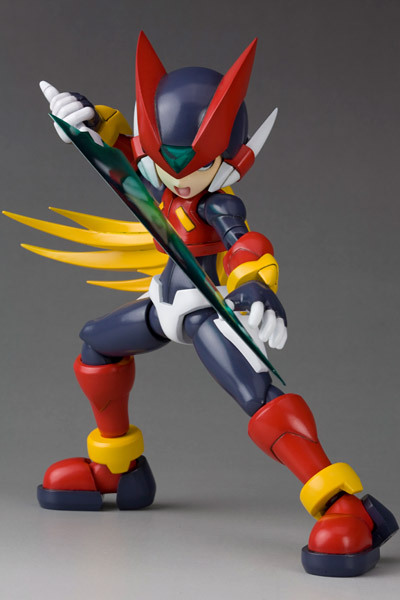 Zero is but the fourth in a series of highly articulate Mega Man models from Kotobukiya, currently consisting of classic Mega Man, Roll, and Proto Man. 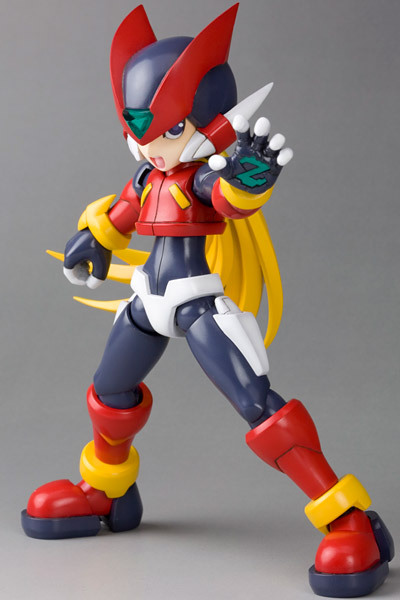 All three figures come with a slew of accessories, and Zero is no exception to this rule. The red rocker is set to be included with a Z-Saber, Z-Knuckle, Buster Gun, and interchangeable faces. An official price tag has not been announced, however, we can expect something within the $25-$30 range. A handful of online retailers have already begun offering pre-orders for the localized figure, some of which can be found via a quick Froogle search. As we wind down to December, however, more options in terms of availability will become apparent. Thanks to everyone who submitted the tip! Capcom has unveiled a brand new (Japanese exclusive) Rockman game for Docomo cell phones, entitled Rockman: The Puzzle Battle. Yes, it's exactly what it sounds like. Sporting a rather awesome art style, The Puzzle Battle tasks players to swap and alternate blocks next to each other in an attempt to line up three or more of the same colors horizontally or vertically. If a successful combination is pulled off, Rockman will attack his opponent. The battle is won when the Robot Master's life depletes to zero, which, in true Rockman fashion, grants the player a new weapon. How, exactly, weapons affect the general gameplay remains to be seen. A simple puzzle game, yes, but once again I can't help but be envious of Japan. All those exclusive mobile games... sigh. Ah, well. Maybe one day we'll get one on our side of the pond. As anticipated, Archie Comics intends to follow up the first Mega Man trade paperback, "Let The Games", with a second volume. 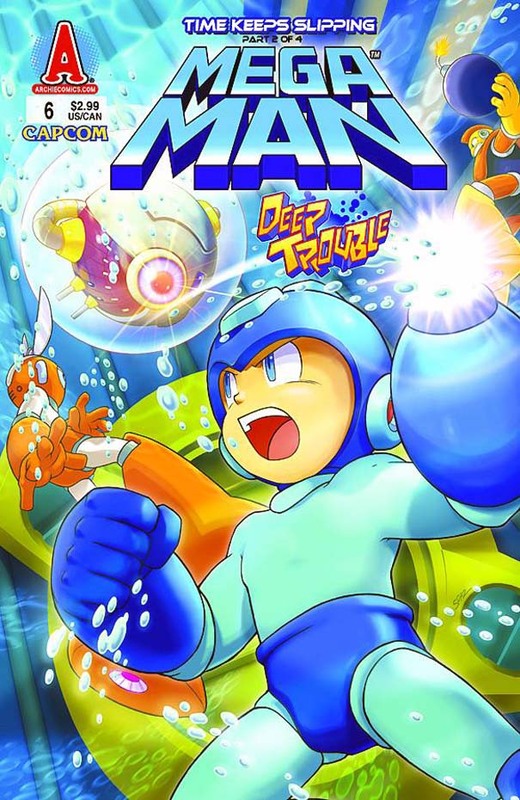 According to a recent Amazon listing, Mega Man 2: Time Keeps Slipping is due out in March 2012. The book's subtitle presents a dead giveaway to the contents of the book: a chronicle of all four issues in the Time Keeps Slipping Story arc; the very first arc in Archie's continuity to break away from the game's stories. Time Keeps Slipping will encompass 112-pages, retailing for $11.99. If the first trade paper back is any indication, we can infer Vol. 1 will contain a handful of additional content like sketches and and variant covers. Of course, more content is probably forthcoming, what with the book having not been officially announced by Archie just yet. Trade paperbacks are an excellent platform to get caught up with story arcs quickly, particularly if you don't have a subscription or if you're just slacking off on your single-issue purchases. It would be great if Archie made a trend of releasing TBPs with every arc, especially for the benefit of those who may fall behind. Pre-order your trade paperbacks at Amazon! Fans across the globe united under the initiative to have their art featured in Udon's upcoming Mega Man Tribute. Artists both young and old scurried to produce a piece that properly displayed their heart and passion for the series; the end result being some truly amazing work. Unfortunately, not all submissions could make the cut. This was not necessarily due to the quality of the product, but more so to the fact that Tribute can hold only so many entries. Regardless, for those who've been turned down, you need not fret, a project is brewing to give your piece the audience it deserves. A fan by the name of Soul-Rokkuman has kicked off an initiative to collect ALL rejected Mega Man Tribute entries into a digital fan-book. Dubbed the "Art Buster Fan Book Project", the effort aims to grant acknowledgment to artists and their respective entries that weren't published in Mega Man Tribute. Regardless of artistic ability or skill level, everyone who was passionate enough to attempt to get into Mega Man Tribute deserves to have their work featured and shared. This fact, alone, is the driving force behind Art Buster. Artists interested in contributing their rejected entries can learn more about the project at Soul-Rokkuman's DeviantArt page here. Submission will be acceptable for at least another month. Afterwards, compilation will begin and the file will be distributed freely. We'll have more information the book's release date and other details in the near future. I applaud Soul-Rokkuman and contributor Alyssa for their efforts in getting this project off the ground. It's definitely something I will stand by, and I hope you will too. 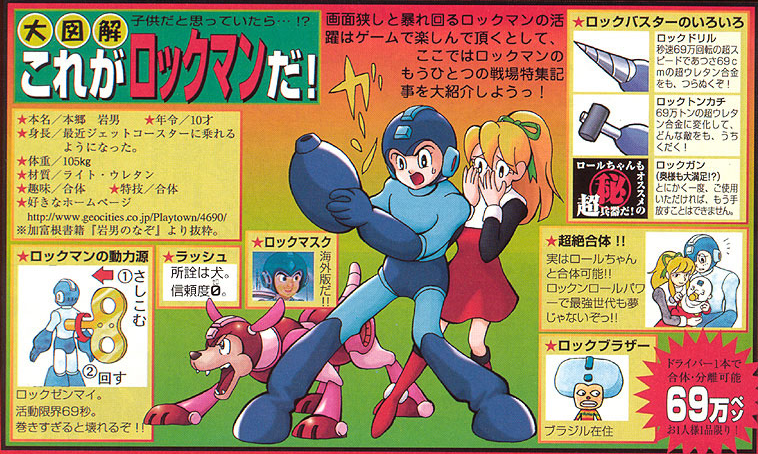 As we've seen in the past, Capcom's former Secret File magazine is home to some oddball self-homages like "Rockman Vs. Doctor Marvel." Secret File #18, however, takes the crown when it comes to the cheekier stuff. 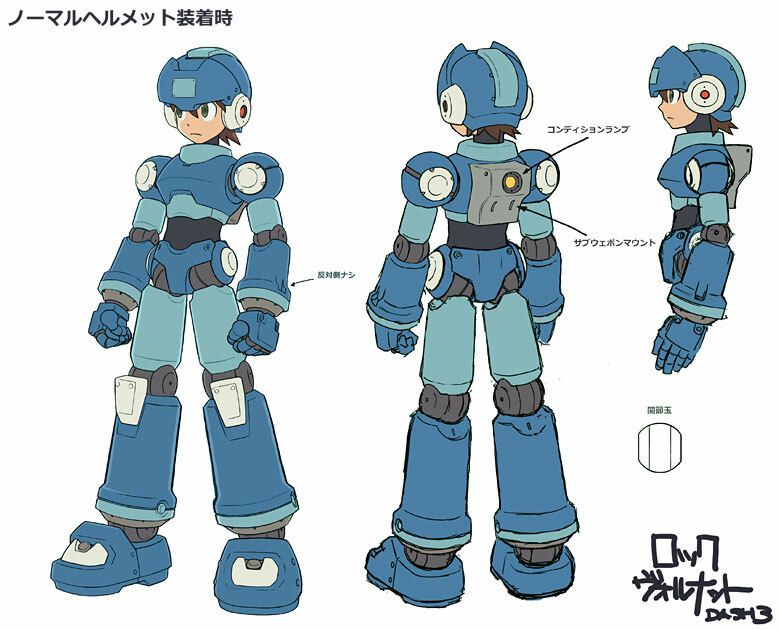 Case in point, a set of schematics for an alternate universe, retro-inspired Rockman. The subtle, implied themes behind this take on our favorite blue robot are giggle inducing, and even a little disturbing. Read the translation at your own risk after the jump! 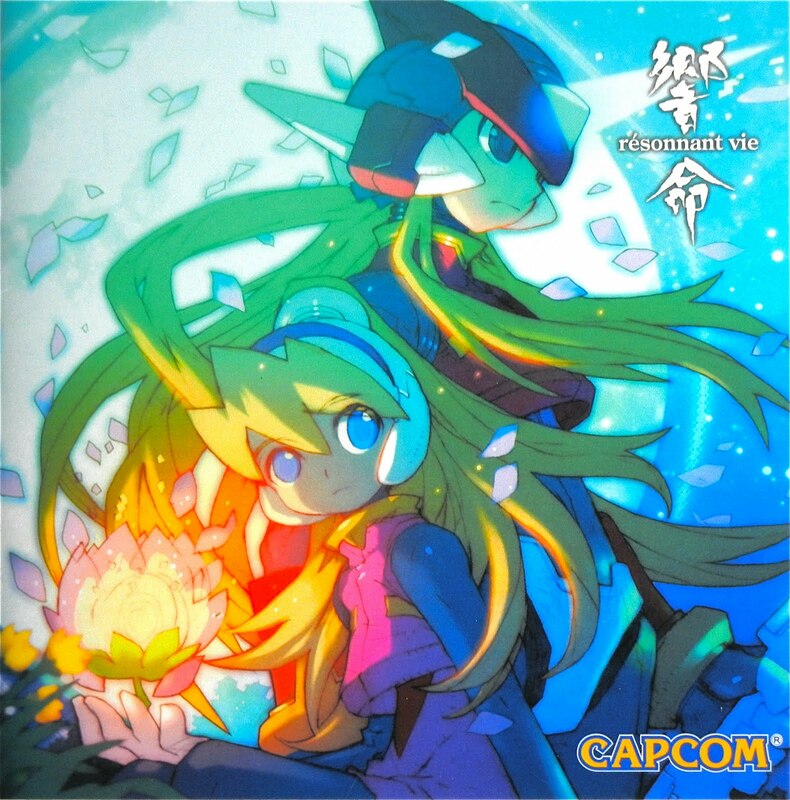 13-years ago tomorrow, one of (if not the) strangest Rockman titles in existence released throughout Japan. 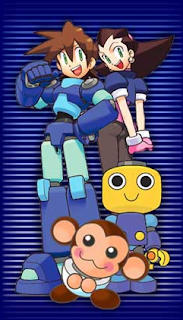 On June 24, 1998, Super Adventure Rockman made its debut on the Sony PlayStation and Sega Saturn, and to this day, it remains an oddity both in the eyes of fans and Keiji Inafune. A game so odd that it warranted an apology from Inafune himself. Super Adventure is unlike any Rockman title before it. It's a strange blend of the interactive FMV genre with elements of first-person/arcade shooter segments dispersed throughout. The core elements that made the franchise unique -- the rock-paper-scissors weakness system and non-linear progression, remained. Despite the familiarity these elements brought to the table, the game just has this aura that screams "out-of-place." I don't know how else to say it: Super Adventure Rockman, while not a bad game, is downright weird. You can feel it the minute you give it a spin. This aura of utter strangeness isn't just limited to gameplay or presentation -- the story itself is bustling with moments and scenes that betray the light-hearted image of the classic series. The number-one rule behind the development of a game targeted at youngsters is to not depict death. Alas, the game was riddled with death; there was no subtlety to it. "The ultimate unspoken role about making a game that is geared towards children is that you simply cannot kill anyone, but here you have military helicopters falling out of the sky and people dying in droves," writes Inafune in Mega Man: Official Complete Works. "If it had been up to me, I would have at least made it so they all 'got away safely' via parachutes or something. Then, as if that wasn't bad enough, Roll dies... and to top if all off, the whole world is destroyed! I was like, 'Did they really need to go that far!?' I will never let them do something like this ever again. If we, as developers, start getting confused about what 'safe for children' means, we'd not only be betraying our players, but I'd feel like I was betraying every single creator that ever put time into this series." The franchise's violence factor has certainly turned up quite a bit in the last ten years or so, but before Super Adventure Rockman, death wasn't so prominent. It was always subtle, comedic even. The fates of those who did die (such as Robot Masters at the hands of the player) where entirely dependent upon the player's desecration. Super Adventure Rockman, however, didn't give player's this privilege to use their imagination. Sure, things turn out well in the end, but to get to the rainbows and sunny skies, players had to get Rockman through quite a few hardships with death hot on his heels. Classic Rockman has always been targeted at a young and impressionable audience: children. There's no denying it. That is why fanon stuff like the Cataclysm Theory (supposed event in which Zero mercilessly kills off the classic series cast) make no sense. Seriously, look at Inafune's comment -- read it closely. There is absolutely no chance something as extreme as the "cataclysm" could happen. Ever. There's more to be said about the game, but you're better off checking it out for yourself. On the positive side, SA sports top-notch FMV animation, voice acting and the plot is actually surprisingly thick in Rockman-terms. To experience the Super Adventure for yourself, you've a few of options. The most inexpensive being watch the game unfold on YouTube (available with optional subtitles). Collector's, however, may want to invest in purchasing the game physically. Ebay is home to frequent Super Adventure auctions, with the PlayStation version being the more common of the two. There's no discriminable difference between the PSX and Saturn versions, so it's entirely up to preference. We've no definitive reason why the game didn't journey to our side of the pond. It could be a number of things from Sony's bizarre no-Mega Man policy to the lack of interest in the FMV genre in the West. One theory that wouldn't be all too surprising is Capcom withheld the game purposely for the very reasons Inafune despised it. Regardless the reason, it was probably for the best. Super Adventure is pretty niche, and the risk of finding an audience would have been far too great. Don your nostalgia goggles and take a trip back to the nineties with the WayBack Machine. At long last, the Internet Archive's crawl has hit Capcom the front, subsequently churning up a plethora of old, official Mega Man webpages. The uncovered sites are a treasure trove of long lost assets, images and media from a number of late 90s - 2000s Mega Man titles. For example, when was the last time you saw these full color, 3D Legends 1 renders? And that's just the beginning: ancient press releases, old release dates, flash games and wallpapers... it's all there. Below, you'll find a small sampling of what the archives have to offer. For the rest, you'll have to navigate around on your own! Because there is so much to look at, I've only glimpsed at few of the hundred or so recently recovered sites. There's still quite a lot to go through and I'm certain you'll find a few things that bring back some fond memories. For example, it's funny now, but just look at how many times Mega Man Mania had its release date bumped. Fond memories with that one. And that 15th Anniversary site? Hours wasted playing that silly little flash game. For the sake of preservation, I highly advise fans and other Mega Man fansites to save as much content from these pages as possible. WayBack Machine isn't glitch-proof, and many archived sites do go down from time-to-time. Better safe than sorry! On a personal note, I grew up on these sites -- they were my stomping grounds as a child. These meager little sites helped solidified my love for Blue Bomber, providing me with screens and news on the then-latest games. Their return to the world wide web may not be a big deal to you, but for me, it's a blast from the past. Have a look around and enjoy! Don't forget that the Mega Man Legends 3 Bright Bats mascot Event ends this Thursday, the 23rd, at 5:00PM PST. If you recall, this event asks Devroomers to design a mascot of sorts for Barrett and his Bright Bat brethren -- a mascot that's along the lines of a Servbot, Birdbot, or Data. Full event rules and regulations can be found here. Remember, just because they are the "Bright BATS" doesn't mean your mascot is entitled to be a bat. Director Eguchi is encouraging fans to come up with a character that's both cool and mysterious -- some kind of thing that looks well when paired with Barrett. The more creative, the better! Of course, what's a Devroom event without prizes? In addition to the bragging rights that comes with the fact your character will be in Legends 3 itself, winners and runner ups will be showered with Unity Points. Always a good thing! If you're still working on your design(s), or even just now considering entering, better get on it ASAP! It maybe Monday now, but Thursday is just around the corner. Check out the above links for full details. 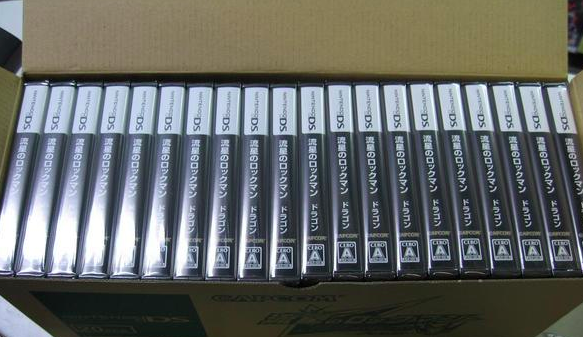 Around this time of year, Japanese game retailers clear out their cache of unsold titles to make way for new releases. Games that nobody wants find solace in carefully placed bargain bins; hoping, waiting for someone to pick them up at a steal of a price. 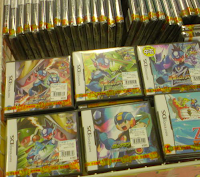 Above, piles upon piles of unsold Nintendo DS Rockman games, from the recent Operate Shooting Star to the original Ryusei no Rockman (Star Force). And no, these aren't used copies -- they're new. Never been opened, never been bought. The games on display above are going from anywhere between 200 to 380 Yen, or roughly $2.50~ $4.73 USD. Curiously, they still fetch a pretty penny to import stateside, OSS in particular. Crazy right? The leftmost bargain bin plays host to well over a few dozen Rockman games, whilst the rest contain boxes worth of unsold Ryuusei copies (in their original factory packaging, no less). It's certainly a sad sight, but one not too surprising given the sales performance of some of these titles in the domestic market. Whether it be Capcom setting their shipment expectations too high, or the quality of the games themselves, it's difficult to determine precisely why these titles in particular faired poorly in their lifetime. 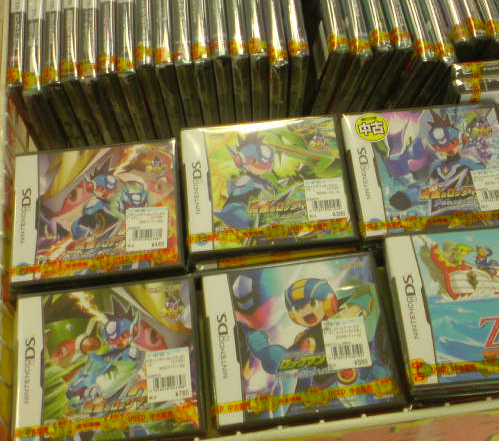 And it's not just Rockman: many games, great ones even, hit bargains quickly in Japan. Zelda, Metal Gear, Final Fantasy -- big name franchises are being sent to these "wagon sales" faster than ever before. Nintendo particularly is well aware of this trend, and as a means to spare Ocarina of Time 3D the same fate as Phantom Hourglass, has shipped a limited number of copies to Japanese retailers. A smart move, one that is said to be paying off. Gaming in Japan isn't necessarily dying, it's sporadic. You're either a hit or a miss these days. Thanks to reader Jimb0 for the pictures from his recent trip to Japan! "Time Keeps Slipping,” Part 2. Dr. Wily has vanished! Roll has been kidnapped! Dr. Light is in federal custody! What’s Mega Man to do? The blue bomber teams up with Cut Man and Ice Man to investigate the ruins of Wily’s castle and search for clues, but what dangers await within? And who are these two, new, powered-up Robot Masters?" Issue #6 will entail 32 pages, retailing for $2.99. An official release date is forthcoming. In related news, we have official confirmation of the first Archie Mega Man trade paperback volume that was leaked via Amazon a few months ago. As speculated, the single volume book will collect issues 1-4, representing the complete "Let The Games Begin" story arc. Furthermore, the book will also play host to a collection of variant covers, sketches, and "special features." Pre-order your copy at Amazon. I get a hefty amount of e-mails every week. Mostly news tips, but more often than not, I receive a lot of questions primarily related to the Mega Man franchise's recent going-ons. While I don't have the time to get back to all of you, I figured it'd be nice if I addressed some of the more common questions I receive right here on the blog. It's a new thing I'm trying out so bear with me. No names; you know who you are! Where is the English Operate Shooting Star Patch? Although lead translator LuigiBlood hasn't gotten around to updating the project's status on the official translation site, he informs me development continues. Admittedly, the project has taken a back seat in priorities, as LuigiBlood is frequently busy IRL (aren't we all?). L.B had hoped to design a specialty program that would have sped up the hex-editing process, but that has hit a bit of a snag. Nevertheless, OSS in English is coming... we just don't know when. Bear in mind, these projects can take quite a while, years in most cases. Have patience and look forward to the final product! Any word from 'The Shadow'? While I continue to remain in contact with the famous leaker, we've nothing specific to divulge at the moment. The Shadow was made famous for leaking the first word on the existence of Mega Man 9 and Mega Man Legends 3 -- but, I'm afraid, he has nothing new to share at present. Should something appear on his radar, you'll hear about it here. On your Twitter, you once mentioned something about a pre-release/beta Mega Man X4 dump. What's up with that? 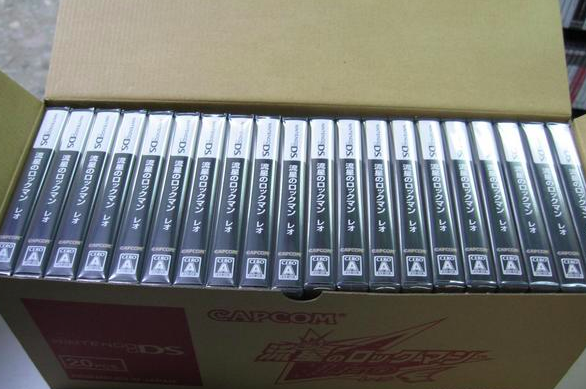 A good friend of mine, who previously contributed to the dumping of the two Rockman 8 beta versions, recently acquired an early build of Rockman X4. How early of a build? Hard to say at the moment, but he's currently evaluating its contents. We haven't discuss the prospect of publicly dumping the game yet, but I think we'll get around to it eventually. Wish I had more to say on this one -- I'm a sucker for pre-release stuff. When news hits, I'll let you know! I heard Capcom is making a Mega Man Star Force 4. Is this true? As far as we know, Capcom is not developing a Star Force 3 successor. While I cannot speak for the company internally, there's enough external evidence that suggests a fourth title isn't in the cards. From a financial standpoint, the Star Force series wasn't nearly successfully as its predecessor series, Battle Network. Each title in the SF series sold worse than the last, with Star Force 3 barely breaking 100k units. Lack-luster game sales resulted in the end of numerous cross-media ventures. In fact, Star Force 3 marked the first time in a little under a decade a "Network timeline" game was not accompanied with an animated series or toy line. The brand simply wasn't financially viable enough by the time of SF3. From a plot standpoint, there's really not much Capcom can do with the characters to warrant a fourth adventure. Star Force 3 ended, for a lack of a better word, perfectly. Events concluded nicely, and character resolutions were plentiful (and satisfying). Star Force 4 would only be milking it, and that's not what the franchise needs right now. Gameplay-wise? Ask yourself, is there really anything more they can do with the SF formula? You can throw in all sorts of gimmicks, transformations, and whatnot, but that's all trivial -- superficial, even. None of that really solidifies or enhances the core gameplay elements of Star Force. It's just sprinkles and glitter. The Network timeline, consisting of both Star Force and Battle Network, is resting. It isn't dead, it's resting. Where it will go from here is anyone's guess: revert back to a winning formula with a new Battle Network (while attempting to keep things fresh)? Or proceed forward with something new entirely? The ball is in Capcom's court. Even though Mega Man Universe is dead, do you believe a prototype version will ever get leaked? It's only a matter of time. "Betas" of current-console generation games are extremely difficult to come by, but within the next few years, things should slowly begin bubbling to the surface. In the case of Mega Man Universe, cold-hard data of the game does exist -- it's been demoed publicly at various events throughout last year. 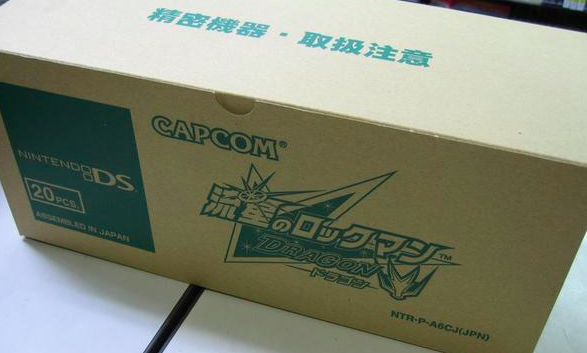 It's the hope of many circles that some brave soul who's closely tied with Capcom will release it under-the-table. That's how these things usually go: it's always either a former member of the press, or a former developer that brings this stuff to light. However, I gotta say, MMU's hypothetical prototype release is years down the road; I wouldn't be surprised if it took ten or more years, even. Once this console generation comes to pass, then you can begin crossing your fingers. 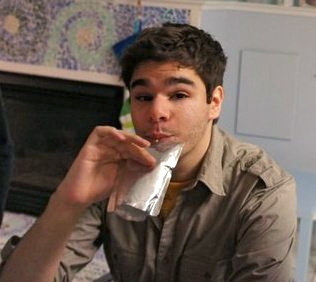 Alright, that's my spiel. If you've any more questions, send me a line: rockman20xx(at)yahoo(dot)com. I can't guarantee a swift reply, but I read everything. Hey, if I keep getting questions similar to the above on a frequent basis, I might turn this into a weekly thing! Some time back, Ippo Yamada held a special Rockman Sound Event in Akihabara to commemorate the then-forthcoming Resonnant Vie soundtrack. It was an hour-long jam session, apparently streamed on May 15th as an encore to the December performance. For those that couldn't attend (i.e all of us), a recorded version of the show is now available online in its entirety. Embedding is a bit wonky at the moment, so check out the show's official Stickam channel to watch. If you've got the time, I implore you to give it a watch -- top notch performances headlined by none other than Inti's own sound team and Hitoshi Ariga. ...wait, Ariga? Yup. The man behind Rockman Megamix took some time out of his busy schedule to perform with the group! With the nickname "Mr. Tambourine Man", it's not too difficult to spot him amidst the crowd. Thanks for the tip, Robert. As of an hour or so ago, Mega Man 5 is now available for download on the North American Virtual Console. The game, retailing at 500 Wii Points, leads the pack of Nintendo's first batch of newly scheduled Thursday updates (as opposed to Mondays). Ah, but what of Dr. Wily's Revenge? I'm sad to report it's a no-show this week. Despite releasing on the Japanese eShop last week and receiving an official ESRB rating, the Game Boy classic didn't hit the U.S eShop today. Take heart that it is coming, though we can't be certain when. Now with MM5 out of the way, we've only one classic series title left to complete the Virtual Console NES lineup -- Mega Man 6. Heck, won't be long before we start seeing the likes of Mega Man 7 and maybe even Rockman & Forte hit the Virtual Console. What of RockBoard? Eh, it's possible... but unlike most of the JPN Virtual Console imports, it's pretty heavy on Japanese text. Doubtful Capcom (or Nintendo) will spare the effort to translate it. Well, you never know. We'll keep an eye out. A plethora of retro-infused Mega Man goodies are heading Stateside this fall from GE Animation. AAA Distrubtion, a national distributor for all sorts of anime and game-related merchandise, has begun accepting preorders on a number of official misc. Mega Man goods from phone straps and pins, to patches and wallscrolls, all due out in late September. From the looks of it, the phone straps are indeed localized (and far more inexpensive) versions of the Dot Strap charms that hit Japan a couple months back. Many characters are absent from the initial listing, but those could be forthcoming. The other items are predominantly exclusive to the U.S market, having not been released in Japan (i.e wall scroll and patch). You can check out the forthcoming goodies for yourself right here. Most of AAA's items usual shoehorn themselves into a number of specialty retailers across the nation -- Hot Topic and the like. Very little doubt they'll remain exclusive to the online front, so there's a good chance you'll find these in-store around September. GroundMan, our go-to-guy for rare arcade game footage, has released a handful of Rockman EXE: The Medal Operation media. Never before have we've seen the game in such high quality, let alone heard its soundtrack. Tonight, you're getting a taste of both! GroundMan has also provided a .pdf manual for the game, translated into English. Download that here. Released in the fall of 2005 to coincide with the release of Rockman EXE 5, the Medal Operation marked the EXE series' first foray to the arcade scene. layers deposit a specific amount of "medals" (arcade tokens) into the machine to initiate the game. Once started, you play a series of EXE 5 themed mini games, which once successfully beaten, warrant prizes such as extra tokens or CHOCOLATE! The mini games are presented in the form of stages, which take place in a variety of areas from Rockman EXE 5. Very little details exist about each individual mini game, so make of what you will from the above footage. GroundMan was kind enough to provide me with a link to the retailer that actually sells Medal Operation cabinets publicly. KNT offers both Medal Operation and Battle Chip Stadium, albeit at a pretty penny. Head on down to their place here if you're interested. Tomoko Kawakami, the voice of fan favorite Rockman EXE character Princess Pride, passed away on Thursday, June 9th. She was 41. Kawakami was diagnosed with ovarian cancer in the summer of 2008, a condition that led to her hospitalization. Thereafter, she began treatment, a process that forced her to take a leave of absence during production of " Ikoku Irokoi Romantan." 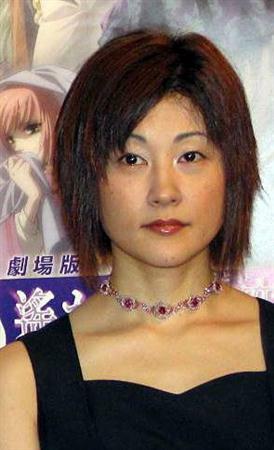 The role was relinquished to fellow voice actress Yuki Kaida. Making her splash in the VA business in 1994, Kawakami will be remembered for her lead role in the Japanese version of Revolutionary Girl Utena, Sgt. Frog, Air, and a number of other roles. Fans of the Rockman EXE anime series will no doubt recall her angelic performance as Knight Man.EXE's operator, Princess Pride. The role would carry her through the majority of EXE's run, all the way up to the program's final season, Rockman EXE: Beast. I send my deepest condolences to her family. She will be missed. Mega Man's style, from any series, definitely adheres closely to the Nintendo mythology in terms of design and character. I won't say classic Mega Man specifically, but it was easy to mistake him for a first party Nintendo character back in the day. 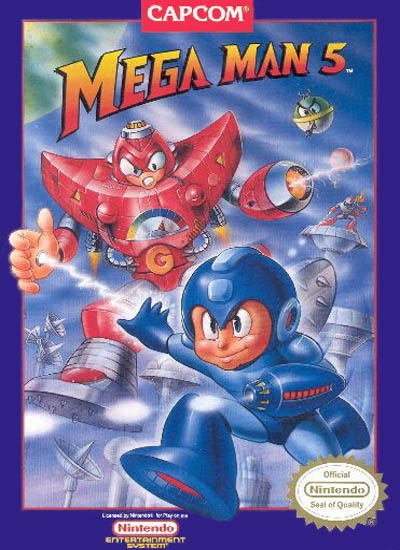 Classic Mega Man is pretty darn synonymous with Nintendo, if you ask me. Sure, other Capcom characters could work in Smash 4, but, really, could you see Leon S. Kennedy or Jill Valentine going at it with Mario and Kirby? 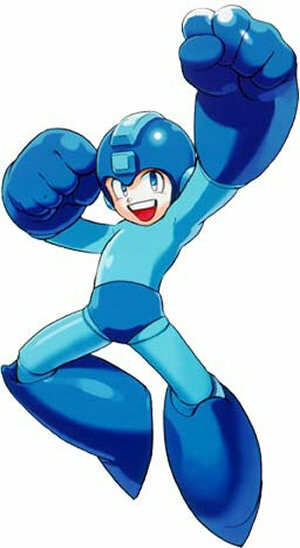 Er, maybe... but Mega Man certainly seems like a better, more appropriate fit amidst the already famous SSB roster. 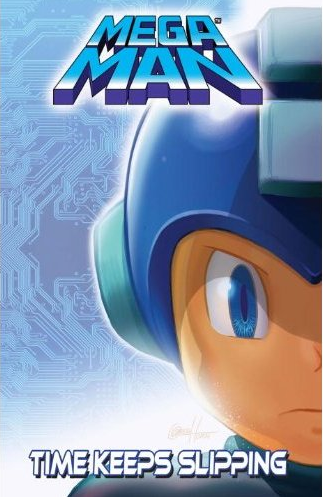 Wedge Holding’s Brain Navi site has gone and updated their product listing for Hitoshi Ariga's Rockman Maniax to include the book's cover art. 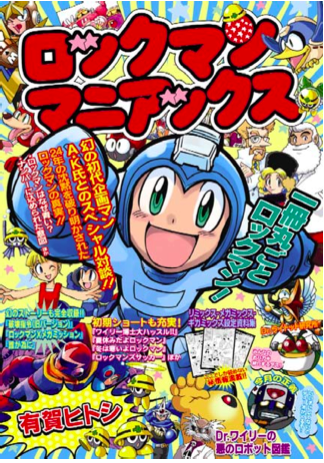 As you can see, it's a colorful splash of characters and antics from some of the stories featured in the compilation; a slew of gag comics from the mid nineties, Rockman X Megamissions, and more! 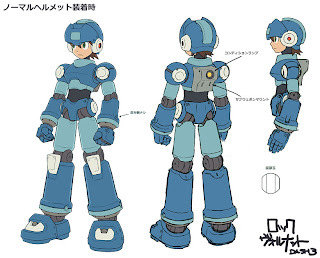 Maniax is said to include all of Ariga's 1997-98 gag strips, Rockman Remix's "Destruction Order" and "Rockman X Megamissions" stories, a variety of four-panel, miscellaneous strips, conceptual art, and a supposed new, untold story exclusive to the anthology. With so much content, you can bet this is going to be one thick book! And you're right: Maniax clocks in at an enormous 425 pages in A5 format. Original due out this month in Japan, Wedge Holdings has since revised the book's release date to July 11, 2011. An official price tag has yet to be disclosed, but Amazon is offering pre-orders at 2,625 Yen (roughly $32.67). Sounds about right for an A5 book. Maniax certainly seems like a fun project, especially if you're a fan of Ariga's light hearted mini strips. No word on this one coming Stateside, but given UDON's recent localization track record, I'd say chances are good. With the conceptual phase out of the way, the dev team can now get down to modeling the design into the actual game itself, which will surely look great in action. As you can see, Design D sports a more "rugged" image than previous choices, complete with additional creases, curves, and other nifty little attributes. Don't know about you, but I'd say Mega Man is certainly looking a tad older in the face, yes? Satisfied with the result? Sound off in the comments! 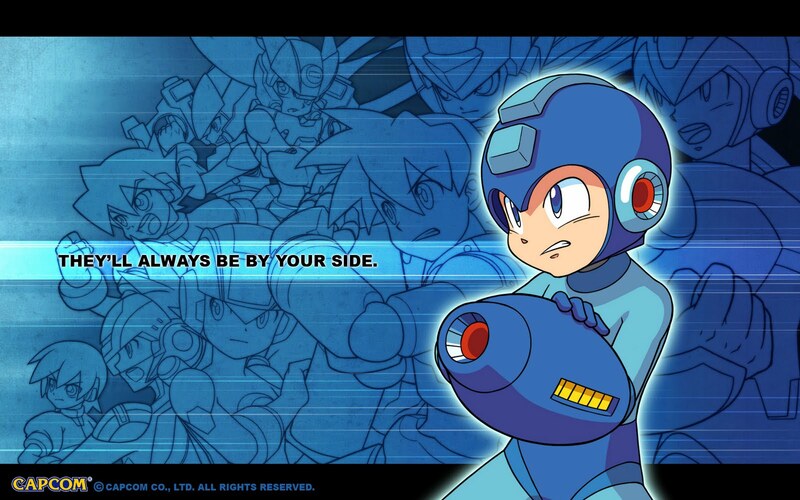 June 9th is here, and Capcom is commemorating "Rockman Day" with the release of a special desktop wallpaper. 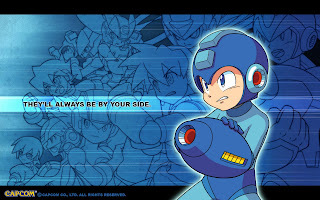 Available in three sizes, the illustration features every Rockman from each series striking a pose amidst a single, powerful message: They Will Always Be By Your Side. You can download the wallpaper directly at the Japanese Devroom here. No doubt Greg will get this up on the English Devroom soon, but why wait? It can be yours now! As discussed in an earlier post, Rockman Day is a bit of a new "holiday" celebrated by Japanese fans, a play on the Japanese words for June 9th; "6" (roku) and "9" (ku) are pronounced "rokku" when combined. Rokku= Rock, i.e Rockman. For those interested, you can read up on the day's complete history right here. This year, 2011, marks the first time Capcom has recognized the holiday officially. There's no tradition or ritual set in place Rockman Day; it's all for fun. 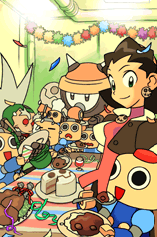 Simply celebrate by indulging in Rockman-related activities -- games, comics, whatever! It's our day. Enough of those bland, grey prototype shots! 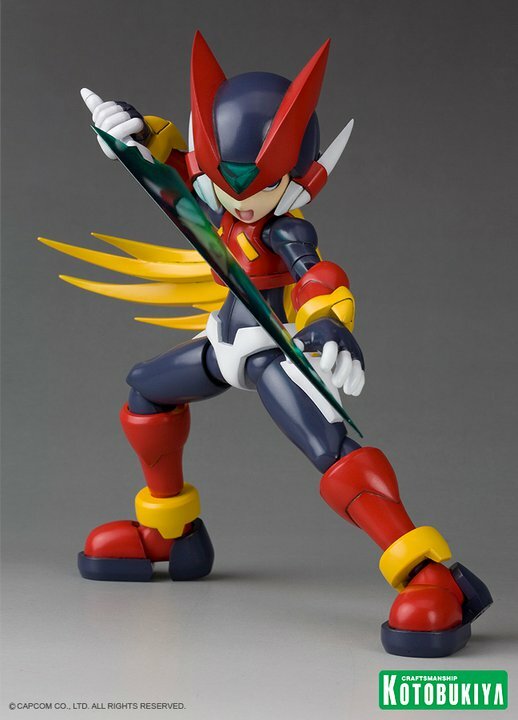 Now's your time to show your true colors, Zero! Kotobukiya has unveiled the final, full color mold of their upcoming Rockman Zero model kit, and needless to say, it's looking spiffy. Zero was originally due out in Japan this month, but has been delayed until October. The model kit includes a number of accessories, such as Z-saber, Z-Knuckle, Buster Gun, and interchangeable faces. All this comes in an incredibly awesome boxart, pictured in the above. Not sure if its Nakayama's doing but, man, it's a beaut. Tomorrow, June 9th, is Rokku Day in Japan. As outlined by Devroom liaison Greg, the ninth day in June yields the following pun: "in Japanese, "6" (roku) and "9" (ku) are pronounced "rokku" when combined. 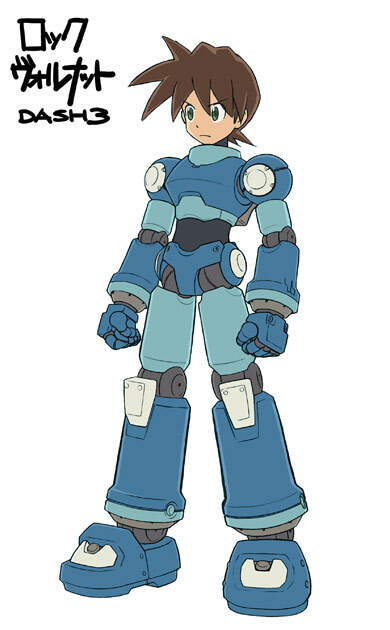 Moreover, MegaMan's name in Japan is "Rokku." Rockman Day has quickly become a bit of a holiday amidst the Japanese fanbase. Beginning as an internet meme around two years ago, a variety of fansites and blogs recognize the day, albeit without a specific means of celebration. Nevertheless, the Devroom, in honor of the day, is planning a surprise. Rockman DASH 3's main composer, Uratani, was appointed as the "Chief Rokku Day Stirrer-Upper", a task that will take him off of his regular composing duties to try his hand a running the devroom tomorrow. As such, according to Kinako, he'll be preparing a treat for Rokku Day. With Uratani leading Rockman Day, there's a subtle implication tomorrow's surprise is music related. A taste of the game's soundtrack, perhaps? We'll find out in less than twenty-four hours! 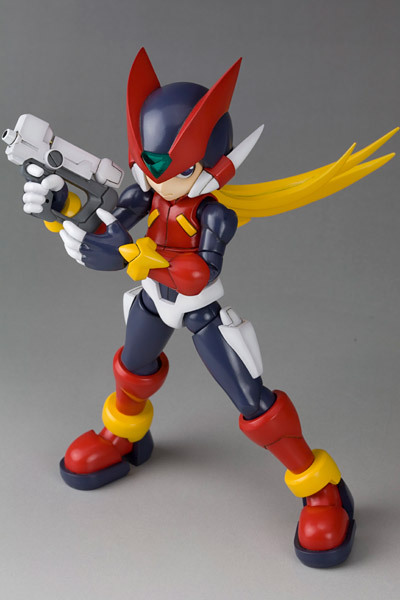 The original Mega Man X saw a mobile phone release in Asia recently, and despite being touted as a direct port, the game actually houses a few new bells and whistles; from tweaked graphics and sound, to time attack and beginner difficulty modes. The game's latest firmware update hit a few weeks back, which offered the most significant addition to the game yet: Navigation Mode. Taking a cue from the mid-to-late X series titles, MMX mobile now features a new heads-up assistance system, in which Dr. Light offers tips and hints about how to progress through the game. According to tipster G-Star, Dr. Light's dialog, in these instances, are said to be very "life-like." In other words, he's seemingly aware of X's current surroundings, despite the fact that he's been dead for quite some time. Those fluent in the Mega Man X lore will note that Dr. Light passed on years ago, however, he manages to communicate with X via pre-recorded messages attached to Armor Capsules dispersed throughout the globe. However, what's curious about Light's depiction in Navi Mode is that he's self-aware. Dr. Light has actively conversed with characters from beyond the grave since Mega Man X6, no, Mega Man X5 even. In X5, he's shown speaking to an ailing X, going so far as to even "repair him." When playing as Zero in X6, finding a certain Capsule warrants an active discussion with Light concerning Zero's identity. These instances of a sentient posthumous Dr. Light have even led to some circles to believe that, perhaps, Light isn't limited to a mere hologram but something along the lines of Cyber-Elf X. Or a force ghost thingamajig. Admittedly, we might be looking too much into this, but hey, it's fun to geek out on these sort of things. Thanks for the tip and video, G-Star! Capcom's lips are sealed tight for the time being in terms of what they'll show off at E3 next week, but when it comes to the Blue Bomber, it isn't too hard to figure out. To help you keep your expectations in check, I've laid out the probable titles we might hear from next week, June 6-9. Fair word of warning: this year's looking a bit bare. Mega Man Legends 3 Prototype Version: This one's a no brainer. With Prototype Version delayed past the eShop's June 6 launch, there's very little doubt the title won't show up at E3 in some shape or form. The chances of a showroom floor demo hinge on whether or not Capcom managed to up the game's quality since word of the delay hit the web. If it isn't playable, however, the least we can expect is a couple new trailers and satisfying amount of new screenshots. Ideally, E3 presents a grand opportunity to announce Prototype Version's new release date. The probability of that announcement, too, hinges on how far along the game has progressed since the delay. Mega Man 2 3D: Nintendo are planning a hefty amount of content to entice 3DS owners into accessing the eShop, with one the major players being the advent of 3D Classics. As the name implies, the is a lineup of classic games enhanced in 3D (e.g Excitebike 3D) featuring layered stereoscopic visuals. Mega Man 2 3D is supposedly in the works, according to a statement made by Nintendo of America president Reggie Fils-Aime at last year's E3. We've yet to hear from the title since then, but considering the eShop is launching on the same day as Nintendo's press conference, there's a chance future 3D Classic titles will be discussed during the meeting in some capacity. Rumored 25th Anniversary Project: Rumor has it Capcom will unveil a brand new Mega Man game at the show to commemorate the franchise's upcoming 25th anniversary. Although specifics were not divulged behind the nature of the project, the general consensus among fans indicates it could be anything from Mega Man 11 to a new Mega Man X. Unfortunately, we've very little factual evidence to support this rumor, nor have I heard even a whisper from my big source. I advise you to not get your hopes set too high on this one -- there just isn't enough credence. "Super" Marvel Vs. Capcom 3: Capcom's eerie silence towards MvC3 downloadable content has spawned countless rumors of a forthcoming Super Marvel Vs. Capcom 3. Similar to Super Street Fighter IV, "Super" MvC3 will boast an updated roaster, chock full of characters not included in the original game. An incarnation of Mega Man will supposedly be fully playable this time, amidst a batch of other Mega Man series characters. The prospect of an updated MvC3 seems plausible, although like our 25th ann. project, there isn't much to go by. E3 coverage begins as early as Monday, June 6. I will not be in attendance this year, though I intend to closely watch many blogs and sources for news. Should you need to get in contact with me, shoot me a line: rockman20xx AT yahooDOTcom. UPDATE: E3 has come and gone, and we've no Mega Man news to report from the show. Oh well. There's always next year! The Devroom has launched a new event tonight which focuses solely on the Bright Bats, the rag tag gang of consisting of Barret, Aero and their companions Max, Pic, and Grill. As a member of the devroom, it's your job to design the group a mascot! "The character will be highly mysterious, and will first encounter the Bright Bats in the depths of an ancient ruin. It's up to you to decide what kind of personality this character has, and what it was doing in an ancient ruin to begin with! We're looking for a mascot that will help the Bright Bats stand tall, side-by-side with the already-established other factions (the Bonnes and the Caskett Family)." To design a character worthy of standing alongside the Bright Bats, Capcom has unveiled the profiles and personalities of each member at the Devroom. After reading over all rules and regulations, you can begin work on your design. Every one who submits will receive a prize: a 1,000 Unity Points! other, grander prizes will be on-hand for runner ups and winners. You may submit more than one entry, but you can only receive one reward. Collaborative efforts are allowed, however, only one elected member of the group can receive the honorary premium Servbot number. That about does it! Head on down to the Devroom for full event details and regulations. Best of luck, everyone! 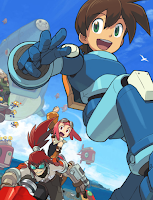 While Mega Man Legends 3: Prototype Version will be missing out on the Nintendo eShop launch next week, fans can look forward to another downloadable title from the Blue Bomber. The original Rockman World (aka Mega Man: Wily's Revenge), will be among the service's Virtual Console launch titles, on June 7. Rockman World will run 3DS owners a mere 400 Nintendo Points, purchasable directly from the eShop. To access the eShop, users must opt-in to a new firmware update. The update will go live during the evening on June 7. 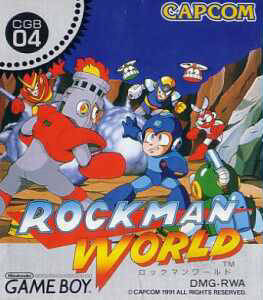 A number of classic games and original titles will be readily available, in addition to Rockman World. Click here for a complete list of all launch software. As of this writing, it remains to be see if Rockman World, err, Dr. Wily's Revenge, release on the North America/European eShop. Nintendo is expected to reveal specifics tomorrow morning. UPDATE: Dr. Wily's Revenge will NOT be available at launch for North America or Europe. Disappointing, yes, but it'll probably end up on our shores eventually. Attending Comic-Con this summer? Then you might want to hop on over to Bandai's both for a one-of-a-kind figure. 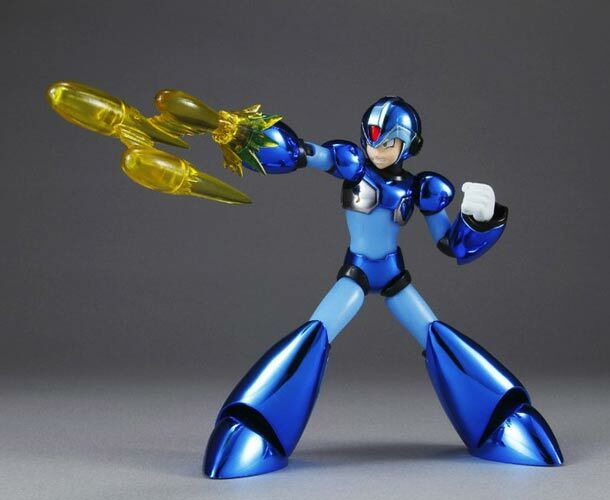 Lo and behold, metallic D-Arts Mega Man X! 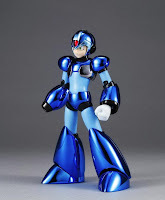 "Bandai Japan's premium collector's label, Tamashii Nations, is proud to announce a very exclusive Mega Man action figure release for San Diego Comic-Con International 2011 with the D-Arts MEGAMAN™ X Metallic Version. 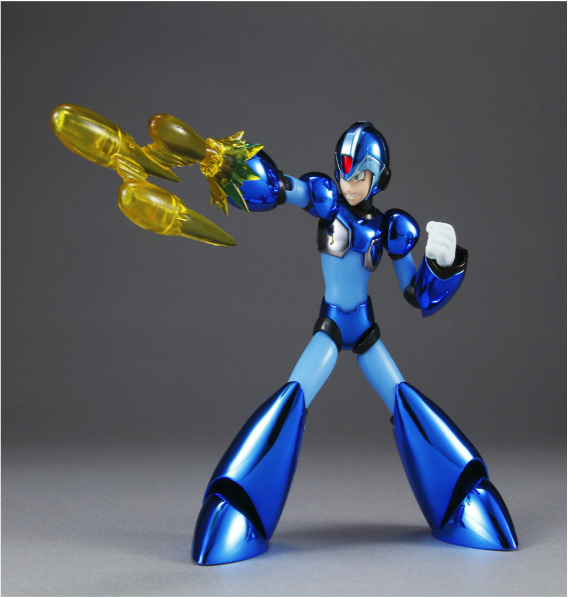 This high-precision action figure will feature shiny blue-metallic coloring, superior articulation, as well as X-Buster blast and rotating triple-shot effect parts. Figure set also includes two interchangeable face parts, as well as interchangeable hand and arm parts." Not only is this a U.S exclusive release for Comic-Con, but a historical first for Bandai Japan's premium label Tamashii Nations. Usually it’s the other way around -- Bandai has Japanese Tamashii Web exclusives that fans overseas are not able to get. A gracious gesture on behalf of Bandai, to say the least. The San Diego Comic-Con kicks off July 21st. These are going to go fast, so make haste and get to Bandai's booth ASAP! Thanks for the heads up, Adam. This month's issue of Nintendo Power is featuring a six-page Mega Man Legends 3: Prototype Version preview, packed to the brim with all sorts of new information. Legends 3's controls have been designed to accommodate the Nintendo 3DS button interface. Movement is mapped to the Circle Pad while shooting is carried out with the R shoulder button. When playing as Barret, melee attacks are executable with the A button, while Y dashes/wall climbs. Camera controls were not disclosed. 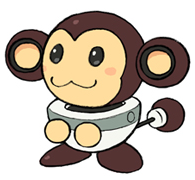 Legends 3 producer Tatsuya Kitabayashi assures fans Mega Man Volnutt will playable alongside Barret in the final game. Confirming original speculations, Volnutt is, indeed, on the moon throughout the course of Legends 3: Prototype Version. The presence of Barret will "introduce newcomers to the series through a pair of fresh eyes." Barret's interaction with old Legends characters, such as Tron and Roll, might key-in series newcomers on the events that preceded (i.e Legends 1 and 2). The titles of Barret's equipment shown off in video demonstrations have been disclosed: Volcanic Leggings (allows players to dish out a flying flame kick), and the Burst Spreader. Missions encompassing Prototype Version include rescuing civilians from Reaverbots, street racing other Bright Bat members, escorting Aero to locations across Teomo City, retrieving Servbots on your hoverbike, and fighting Bullbreath, the rival gang leader. There's an interesting twist in the conflict between the Bright Bats and the local police. Turns out the police chief is none other than Aero's father, a key member of the Bright Bat gang. The chief, in an effort to take down the gang, enlists the help of Roll to build him the “Anti-Rider Crusader,” or the “ARC1." Following that event, players participate in an on-rails shooting segment. The goal is to defeat the Anti-Rider Crusader (piloted by Roll) while avoiding a barrage of tossed cars. Exploring Ruins plays a big role in Prototype Version. Later in the game, possibly after reconciling with each other, Roll tasks Barret to retrieve underground Refractors, which will power her rocket to rescue Mega Man. Barret runs into Tron during his dig, and faces her in her new Devroom-winning mecha. In another twist, Barrel, grandfather to Roll and Mega Man, has gone missing. Nintendo Power subscribers should expect this issue to arrive in mailboxes shortly. The article contains a vast amount of screenshots and artwork. No scans at the moment, so do pick it up if you've got the chance!